Even though the cassette tape is long gone from music store shelves, there's still enough nostalgia for the old medium that it may never die. 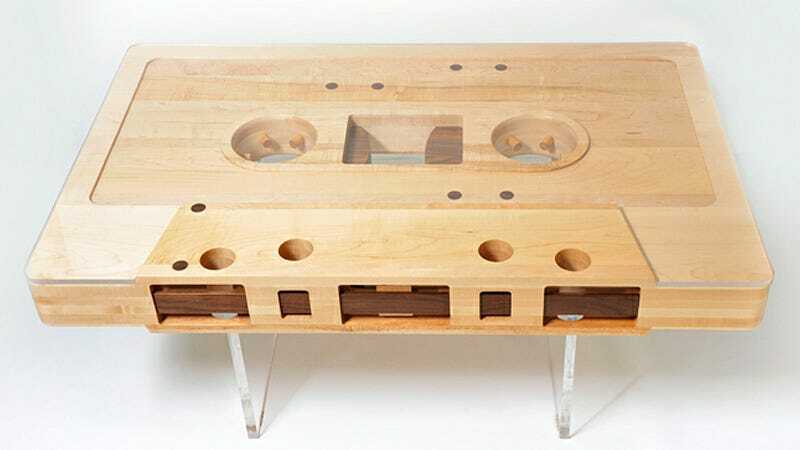 From mixtape websites that let you share a handful of songs, to this utterly fantastic giant wooden cassette coffee table. Hand crafted by Jeff Skierka, the Mixtape table is a 12:1 scale replica of the real (or should we say 'reel') thing. The original prototype pictured here has been in the works for over five years and is made from reclaimed maple and walnut wood with a plexiglass top. There's even a 'B' side if you feel like changing up the wood grain pattern by flipping the table over. So they stay relatively affordable, future versions of the table will be machined out of high-grade plywood with a glass top for added durability. But if you fancy yourself a master woodworker, the Mixtape table is just begging to be copied.